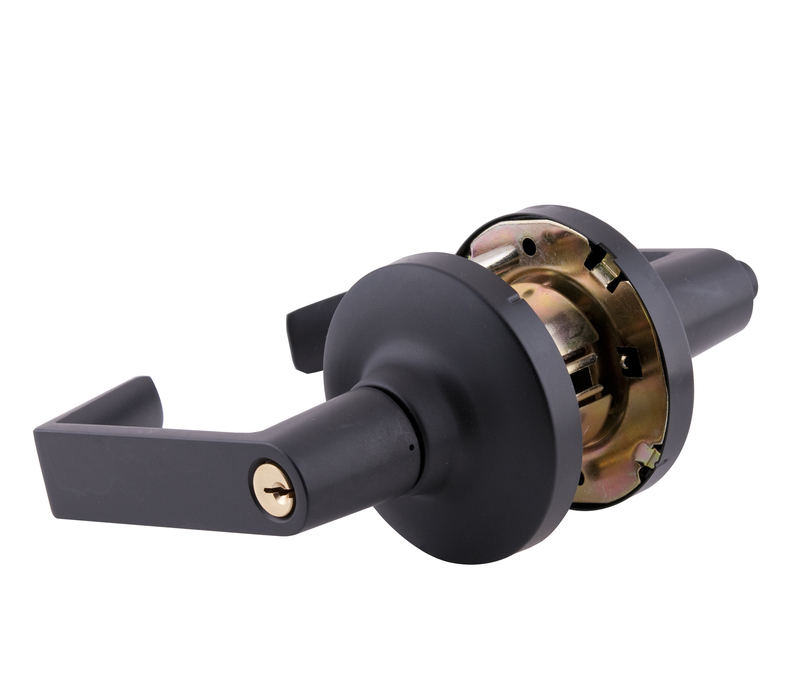 MaxGrade D Series commercial heavy duty cylindrical lever sets have a clutch function and designed with a removable thru bolt for easier installation. Other features include concealed mounting screws, and an adjustable mounting plate. 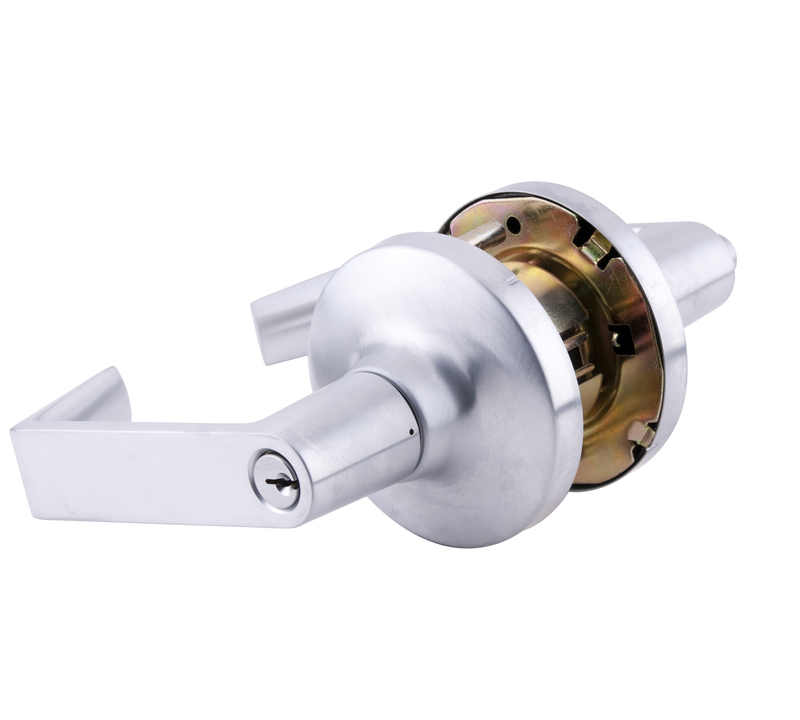 An Office function lock has a push button that keeps the lever locked from the outside until the handle is unlocked by turning the inside, or closing the door. Lever is always free from the inside. - Exposed trim made of wrought brass. Pressure cast zinc lever. - Fits door thickness from 1 3/8" to 2"
- Includes ASA strike 1 1/4" x 4 7/8" x 3/32" Standard, optional T Strike measuring 1 1/8" x 2 3/4" x 5/64". 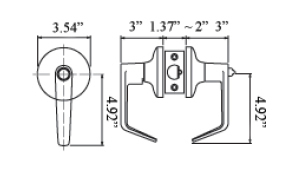 - Latch: 2 3/4" Standard latch with faceplate measuring 1 1/8" x 2 1/4" Square corner. - 1" x 2 1/4" Faceplate available upon request. - Latch bolt is made of stainless steel powder metallurgy with 1/2" throw. - Schlage "C" 6 pin cylinder solid brass keyway standard. - Available in finishes US10B (oil rubbed bronze) and US26D (satin chrome). ANSI/BHMA A156.2-2003 Grade 1 Certified. UL: 3 Hour fire rating, UL file number R13776. - Two knobs (one for each side of the door). *Entrance knobs also include keys. Larger orders keyed alike may not have keys included with every entrance knobset. Not Sure Which Function You Need? 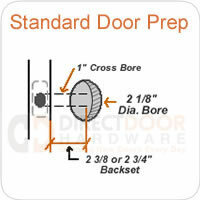 MaxGrade commercial door hardware is available in several functions to meet the requirements of your application. 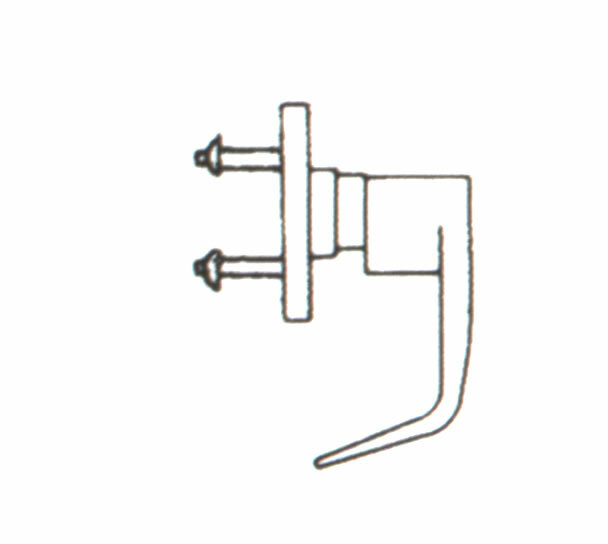 Below is an explanation of each function available in this lever. Entrance Keyed Locks - Turn Push button locking. Pushing and turning the button disengages outside lever requiring use of key until the button is manually locked. Push Button Locking - pushing the button disengages the outside lever until unlocked by key or by turning the inside lever. Clutch function is designed to disengage outside spindle from latch whne in locked condition. Office Function - An Office function lock has a turn/push button that keep the lever locked from the outside until the lock is manually unlocked. this allows you to shut the office door behind you as you leave and it remains locked. Lever is always free from the inside. Storeroom Lock - Outside lever is always disengaged. Enter by key only. Inside lever is always unlocked. Clutch function is designed to disengage outside spindle from latch when in locked condition. Classroom Lock - Outside lever disengaged and unlocked by key. Inside lever always unlocked. Clutch function is designed to disengage outside spindle from latch when in locked condition. Privacy Lock - Inside push button locks outside. Outside unlocked in emergency coin slot. Inside always free (unlocked). Passage Set - Both outside and inside always unlocked. No locking mechanism. 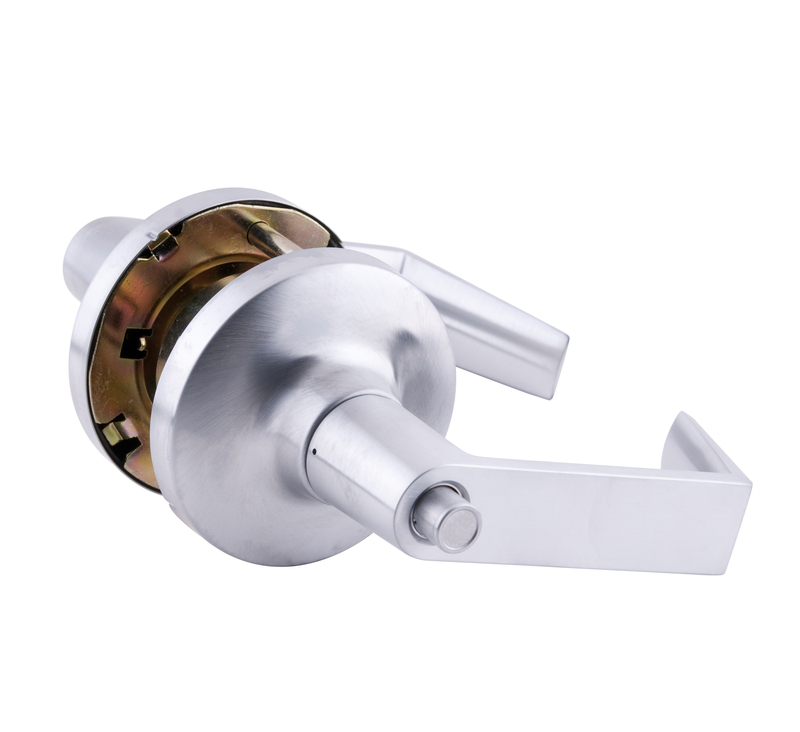 Single Dummy Door Knobs - Dummy lever handles mount to the surface of the door. This is the perfect solution for ball catch doors or other applications where a latch mechanism is not needed, but the look of a leverset is desired. Dummy lever handles are used on doors that do not have a bore hole in them already. If your door is prepped with a bore hole, this function will not work.